Vodka "Russian Standard" as Molotov Cocktail. 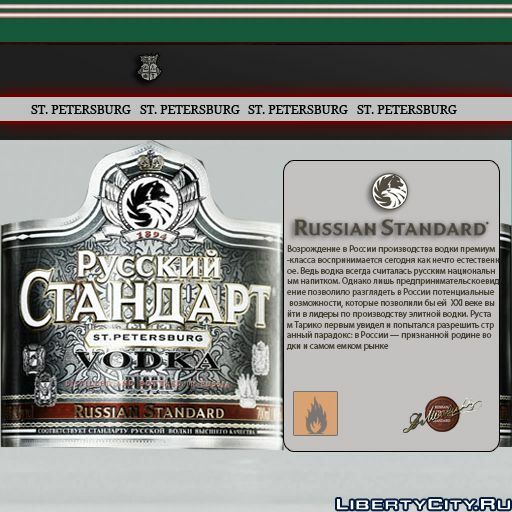 Light the streets of Liberty City exclusively with Russian drink! A nice female voice for GPS in Russian. The voice was taken from some kind of GPS program from Nokia. In the archive 2 versions - one counts in yards, the other counts in meters. A set of new bottles for the "Molotov Cocktail" + Bonus in the archive. Excellent Moskvich 412 in the tuning for GTA 4. Russian camouflage suit in several variants. The PC-version of GTA 4 from 1C.